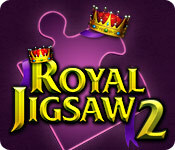 Royal Jigsaw 2 is rated 4.2 out of 5 by 11. Rated 5 out of 5 by Redbridge78 from Lots of Jigsaws! The jigsaws from this developer cover a wide range of subjects and I've enjoyed each new game from them that Big Fish brings to us. The puzzle pieces can be locked down by going to the opening screen, pick the "options" icon, then midway down (below "sound"), on the right side you can choose to fasten the puzzle pieces to the board as you go along---this is a most satisfying way to play. The "ghost" picture option is a special treat, too. It's a wonderful way to enjoy jigsaw puzzles again after giving them up years ago. Rated 5 out of 5 by isis1313 from finally well, finally I have bought a puzzle game that excites me. tons of pictures and at first I thought, here we go again with the 12 piece puzzles but NO you can change to many more pieces. I LOVE it, bought it after 5 minutes!! Rated 5 out of 5 by Heavenlyrabbit from Very Good. Really Nice Photos. How does this compare to Jigsaws Galore? Gorgeous photos that fit the theme. In fact, I like the photos in this more than Jigsaws Galore. You can customize the pieces somewhat but there aren't any "fun pieces". You can't import your own photos. Other points: Trophies and points to win but nothing to "spend" points on. Decent ambient music. I will be buying this game because there are enough photos that I like, it is worthwhile to me. But I would love to see a 3rd installment that really went further… maybe building a castle using points you get by solving puzzles. Rated 5 out of 5 by pennmom36 from Royal happiness Jigsaw Style! I am what you call a puzzle freak, I can put a 1000 piece puzzle together in a few hours time, so naturally I'm a fan of Royal Jigsaw and I never lose a single piece. I love the features available such as ghosting a picture in the background or hanging the image to the side. You can modify any of the puzzles where you choose how many pieces and what shape the pieces come in. You can sort the pieces, choose just border pieces to start with or put some pieces in a box to free up some space. There are achievements to earn and you can change the color of the background. This game has 4 different boxes and each box has 22 pages of beautiful landscapes, people and animals so what are you waiting for, enjoy! Rated 5 out of 5 by JustTheFacts from Lots More Puzzle For Your Dollar BASED ON ONE HOUR DEMO This game’s predecessor didn’t impress me much, but I am wow’d by this one. It has everything, including more great jigsaws than you can poke a stick at. The jigsaw photos come in an apparently random set of 4 boxes, each with 88 photos in each, a total of over 700 pix. They are all clearly professionally taken shots, and while many of them do have a regal theme – crowns, palaces, for example – it’s much more like they have been chosen for their beauty and glamour. There are many pictures of flowers, jewellery, landscapes and monuments. Everything from the Great Wall of China to a butterfly. 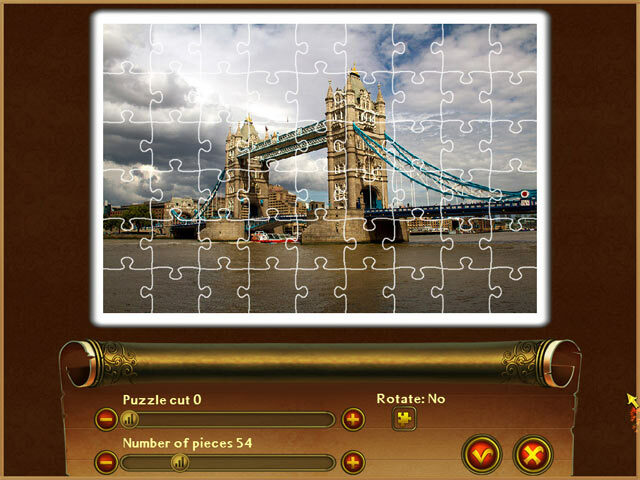 All puzzles can be customised in the following ways: • Number of pieces (from about 12 up to about 300) • Degree of irregularity of the cuts • Pieces can be rotated, or not • Picture in the top left corner, or not • Ghost, or not • Sorted, or not • Borders separated, or not • Background colour, choice of 4 You can get scores based on speed and trophies. The music is pleasant and unobtrusive. The interface harmless, but boring, and I am not sure I like having no instructions regarding the customization, you just have to figure it out for yourself. You are not given an option to stick the pieces to the desktop, which is my one criticism. Otherwise, this game represents *years* of fun to me. Rated 3 out of 5 by creationist from Jigsaws Galore is Better, But This Isn't Too Bad I don't think I remembered how annoyed I was with the first Royal Jigsaw before I got this one. It's not bad, but there are several annoying things, all of which have been mentioned by other reviewers. For me, the worst is not being able to tell if you've already completed a puzzle unless you go to the Best Times section and scroll through all the pictures. What a pain. So I'm reduced to having to do them in order, when sometimes I want to do an easy one and sometimes a hard one. I also don't like the flashes and the inability to change the size of the board or size of the pieces. So I think it's okay, but Jigsaws Galore is a lot better. 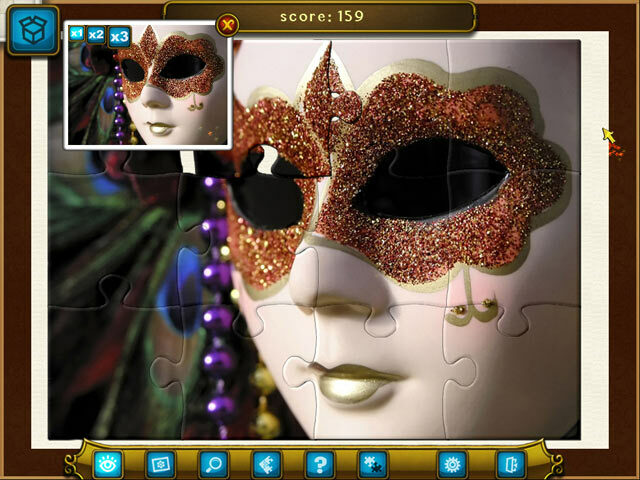 Rated 3 out of 5 by mrm2006 from The Good and the Bad..... Based on the completed Demo: I enjoy putting together jigsaw puzzles and this had a nice variety of 4 "boxes" to choose from a variety of animals, sculptures, architecture, art, castles and so on and so on. The puzzles varied between straight putting them together to a bit more complicated which way does the piece go? The music was consistent all the way through. I would have liked to had heard a variety of music maybe based on what category you were playing. There was a lot of help from giving you a "ghost" of the picture to the picture itself to giving you just the borders and .... so on. Which I'm guessing would be appreciated in the larger puzzles. Now the bad. The puzzles ranged from a relatively easy 12/13 pieces to well over 200+ pieces. My problem stemmed from the pictures I like to do (animals, maybe castles) were either a ridiculously easy 12/13 pieces or an astounding 250+ pieces with no middle ground. As I am just getting back into jigsaws after many years away, to delve into an easier puzzle for 3/4 puzzles was nice but then to have to drastically jump to a monstrous size puzzle was, to say the least, unsportsmanlike. One would rather prefer to start easy and work the way up to monstrous size. You have 4 "boxes" to work your way through - each page (22 pages in each "box") has a variety of pictures to choose from. If the developer just would have had a more middling ground I would have purchased this immediately. But for that reason this Glam-ma is giving it a pass. Please try it for the Free Trial - all you have to lose is an hour. 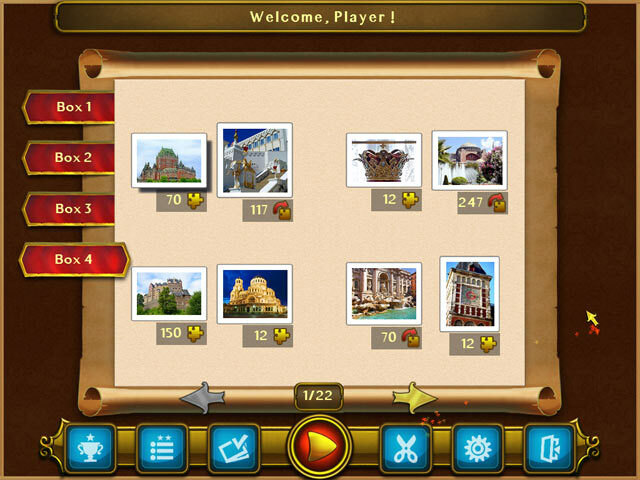 With over 700 unique puzzles, Royal Jigsaw 2 is the choice of real kings!